I had somehow got it into my head that the riders would be stopping in the charming village of Deddington on the Sunday but they had, in fact, had their coffee and tea stop the previous day. Doh! and double doh!! to put it mildly. However all was not lost because there, parked up in the village square, was a single solitary classic motorcycle just waiting to be photographed. Then more appeared and soon there were many. The Jones’ good luck, usually noticeable by its absence, had come up trumps for once and delivered a Banbury section VMCC Sunday run for me to photograph instead. 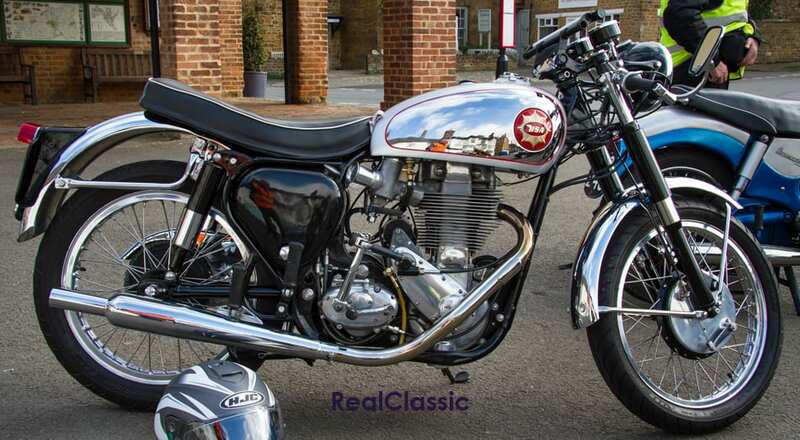 The same is true of its Matchless stablemate which featured an Amal Monobloc carburettor, four gears and drum brakes which Mr Wilson stated were ‘a treat to use.’ It looks pretty good too and it certainly cheered me up no end when I saw it. This James Superswift was another lightweight on the run. 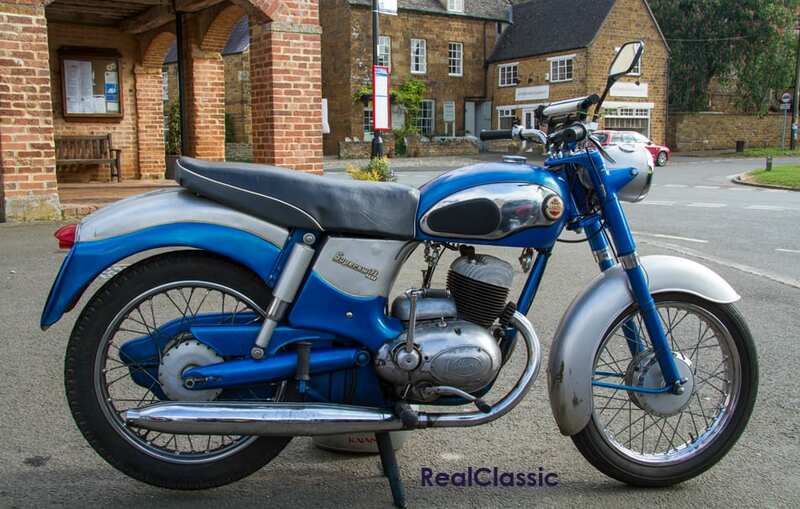 It first saw the light of day the year after the Matchless in 1962 and is powered by a two-stroke twin Villiers 2T engine rather than the four-stroke AMC single. Its 50mm by 63.5mm cylinder dimensions provides a capacity of 249cc, it also has four speeds and there are 6” drum brakes fore and aft. It’s the frame that differs from the Matchless in that it’s a composite with a front top and down tube but with a, presumably, pressed steel fabricated central section and pressed rear mudguard. Another good looker in its Riviera Blue livery which looked just at home in Oxfordshire as it would on the Mediterranean. 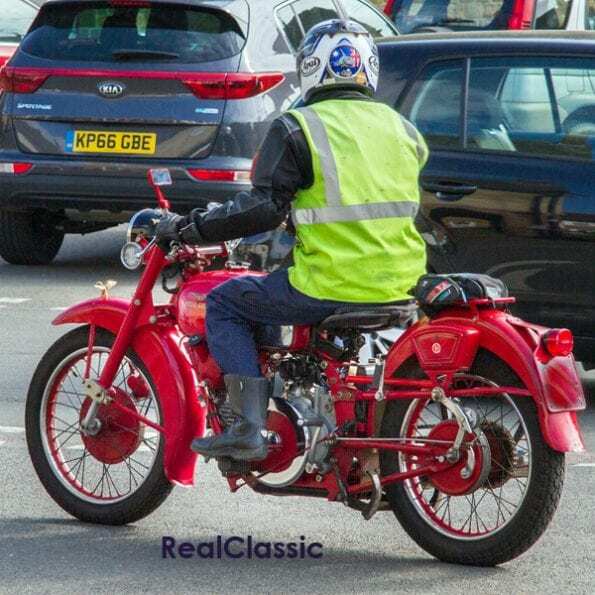 You just knew there would be something red, Italian and gorgeous (my favourite type of old motorcycle) and here it is. I believe this 1967 model is a Falcone which is thought to have one of the longest production runs for any motorcycle as it was in the lists from 1950 to 1968. 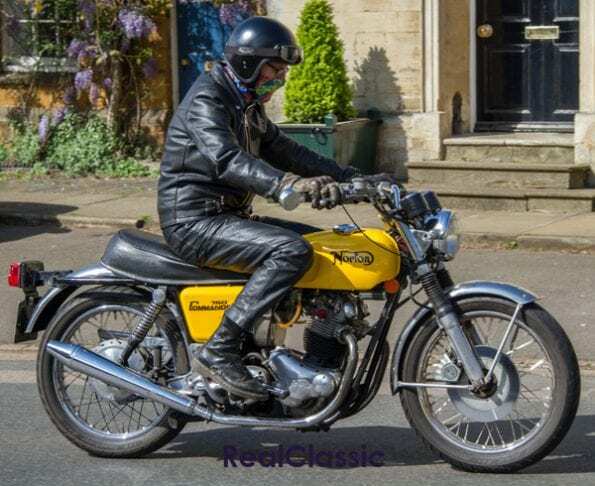 The ohv 499cc single cylinder engine has a Dell’Orto carburettor together with the now familiar four gears and drum brakes – but who cares about the spec? Doesn’t it look beautiful? It’s hard to believe it was manufactured in 1967, some things simply don’t age. 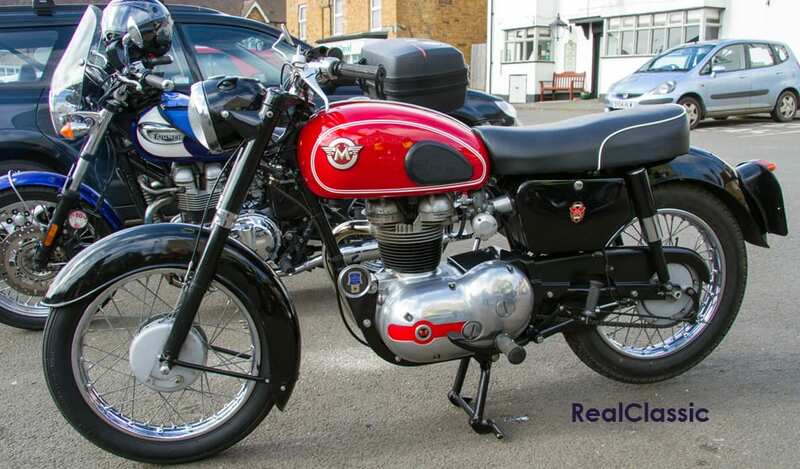 I’m coming to the British triumvirate which we will deal with in alphabetic order so let’s start with this handsome and well-presented 1963 BSA Gold Star. We’ve covered Goldies elsewhere on the site – the owner of this one did a lot of serious work to get it to this state, particularly on the mechanical front. Well worth all the effort. There were two Norton Commandos, one red and one yellow, both absolutely stunning so I had to spin a coin and the yellow one won (sorry, red owner). 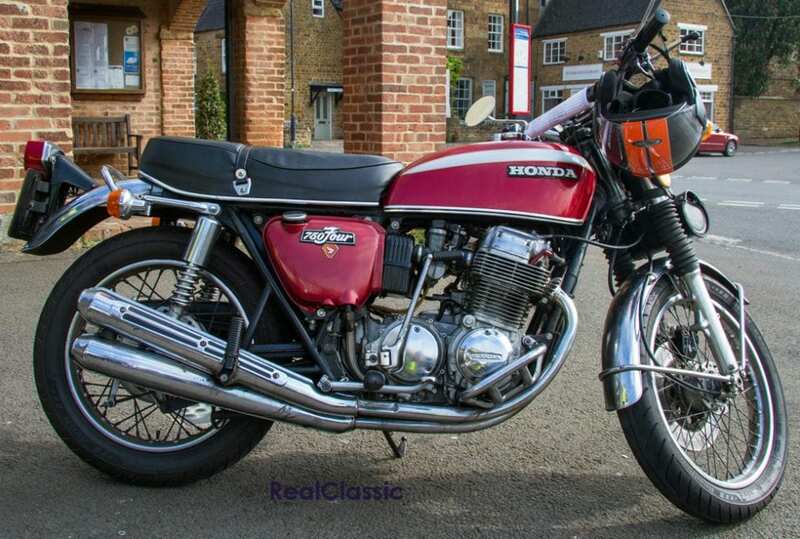 This one’s from 1973; a 745cc twin with Amal carbs, four speeds, disc and drum brakes. Oh – and it’s also become an icon because it looks fantastic and was one of the dying gasps of a doomed motorcycle industry. 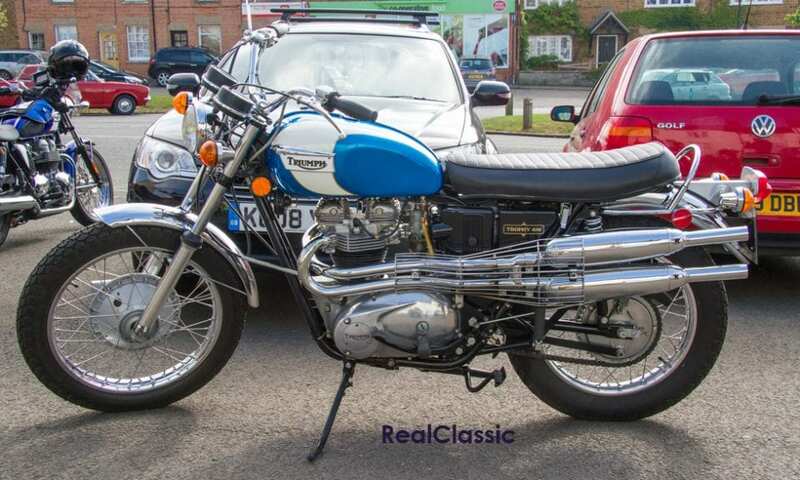 Finally we come to the Ts and although there were several Triumphs present I’ve chosen this 1972 650cc Trophy to represent the breed. Although the oil-in-frame era isn’t to everyone’s tastes, the later unit-construction machines tend to be reasonably leakfree and solidly reliable with a straightforward single-carb set-up, decent brakes, peppy performance and nimble steering. 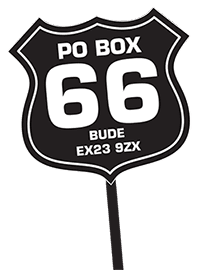 By this point in the Trophy’s evolution it had stopped being a clubman’s competition machine and had become an outright street scrambler – presaging the popularity of today’s ‘adventure sports’ motorcycles. Imagine owning this yourself. Who needs artwork when you could have this decorating your driveway? Royal Enfield got a look in too and this one is a British-built 1961 346cc Bullet. Unlike many single-cylinder Britbikes, the Bullet was designed to be a 350 and not a heavyweight 500. This made it significantly lighter than its competitors. It got an all new welded frame in 1956 and compression was raised to 7.25:1 which together with a new cam profile and many other mods pepped up the 350’s performance. This meant it was almost as quick as its 500 stablemate and could reach 80mph with a following wind. Riders had to rev the smaller engine harder, but many preferred its sweeter nature for low-rev riding. 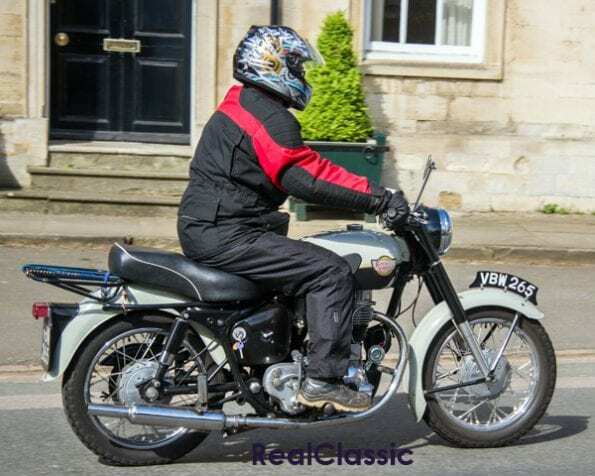 Then from 1959 the 350 gained the tele forks from the Meteor Minor 500 twin, 17 inch wheels which lowered the saddle height, a 7 inch full-width front brake and 7 inch rear brake, revised gearing, a bigger Monobloc carb and a further compression boost to 7.75:1. You don’t see too many of them around these days, but there’s one featured in the June issue of the magazine. I couldn’t decide which motorcycle to finish on so in keeping with the eclectic group in Deddington let’s have a three-wheeler. 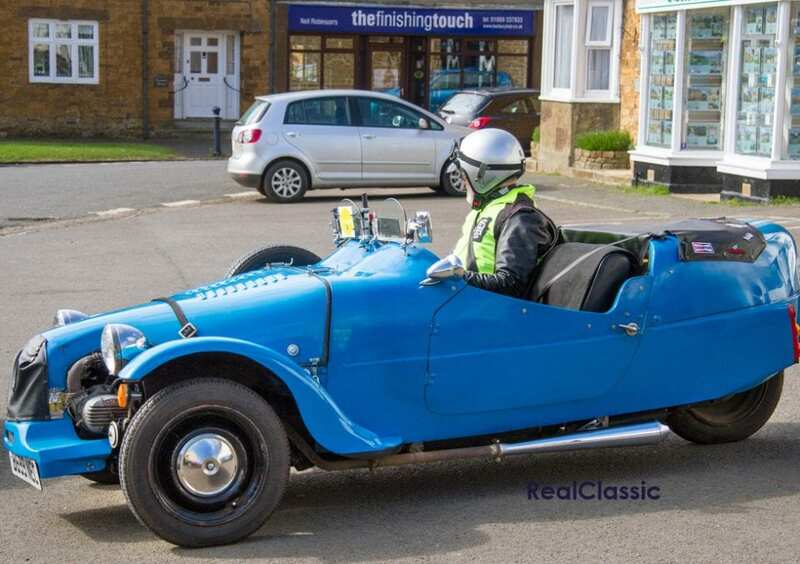 This is a Lomax which is powered by a 602cc Renault 2CV engine. Lomax apparently stands for ‘Low Costs, Maximum Performance’. I’ve seen a few of these and when the time arrives for me to move away from two wheels this looks like a reasonable alternative. In this case it seems like an entirely appropriate ‘finishing touch’! 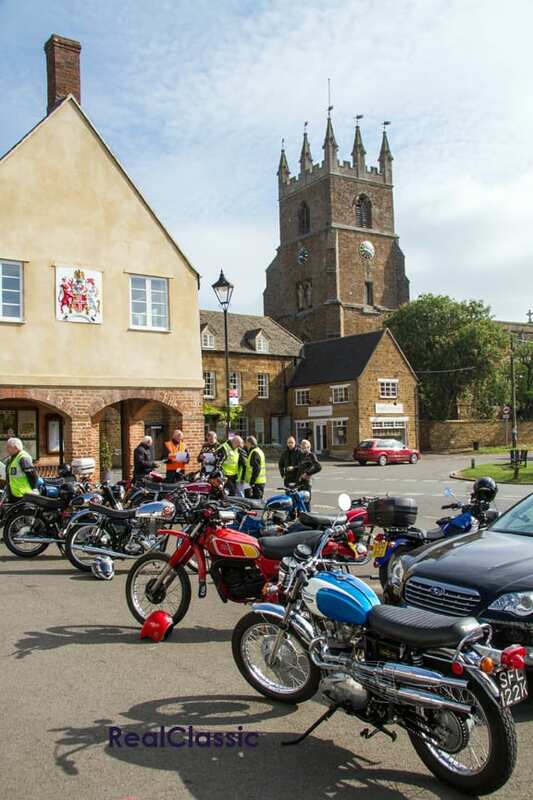 A big thanks to the Banbury section of VMCC for letting me take all the photographs and generally get in their way. Next year I may bring you news of the Coventry to Brighton Run but don’t hold your breath!